Mint meringue cookies are soft and delicate. They are light as air with a touch of mint flavor. For the most part, making meringue cookies is really easy to make. With virtually no ingredients, the main ingredient being egg whites, you don’t need to run to the store to pick up any special ingredients. 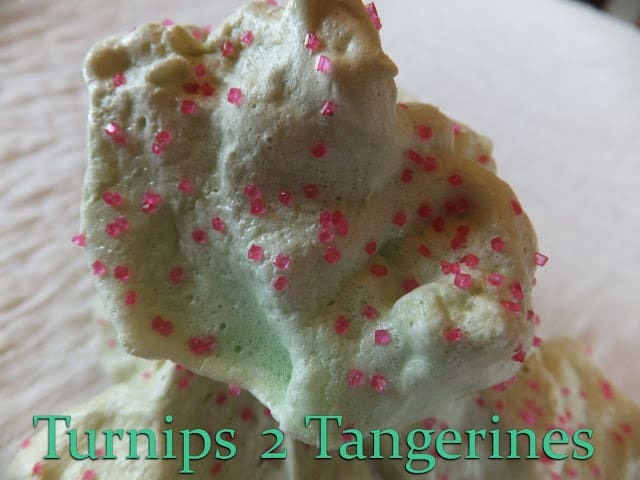 Another fun thing you can do with meringue cookies, with the help of flavored extracts and food coloring gel, meringue cookies can be transformed into any flavor and/or color. One thing that comes in handy when making meringue cookies is to use a pastry bag and a decorative tip of some kind. It’s much easier to pipe the meringue cookies than let’s say to drop them. Also when using a pastry bag and decorative tip you’re able to add colors to the bag for a swirly look. This adds a nice whimsical look to the meringue cookies, great for any holiday. 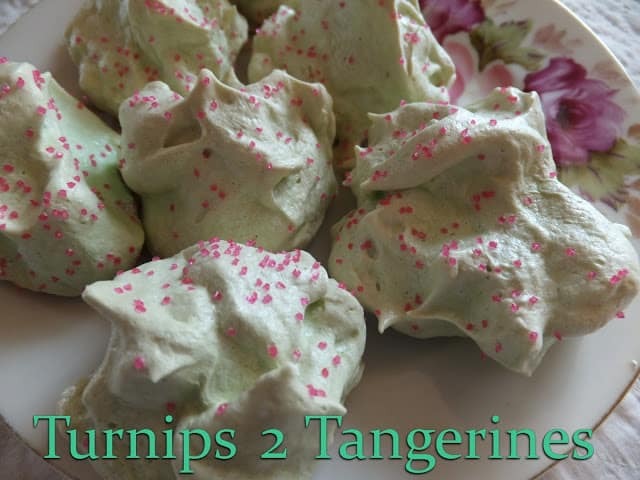 Take a peek at Peppermint Meringue Kisses for inspiration. Meringue cookies can be decorated with a vast array of sprinkles and food coloring. 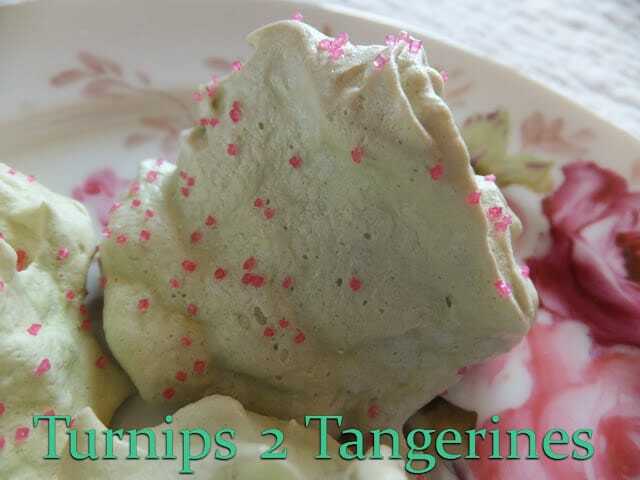 My favorite meringue cookies here on Turnips 2 Tangerines has to be this recipe for Pink Strawberry Rosette Meringue Cookies. Perfect for Valentine’s Day or for a little girls birthday party. With the addition of red gel food coloring and strawberry extract, you take an ordinary cookie and transform them into an unforgettable cookie. Light, Airy, Minty and Delicious! In a medium bowl, beat the egg whites, salt, vinegar, extract and food coloring on medium speed until soft peaks form. Gradually add sugar, 1 tablespoon at a time, beating on high until stiff glossy peaks form and sugar is dissolved, about 6 minutes. Drop by rounded teaspoonfuls 2 inches apart onto parchment lined baking sheets. Sprinkle with pink crystals if using. Bake at 250º for 40 to 45 minutes or until firm to the touch. Turn oven off. Leave meringues in oven for 1 to 1 1/2 hours. Remove cookies to a wire rack, cool. I'm sorry but as pretty as your photos look, this recipe was awful. You clearly failed to list what the letter "t" stood for, teaspoon or tablespoon. Making it very confusing for your readers to interpret. G'day How cute! Love your photos too! Meringues are so easy to make, and they look so pretty! Often I think meringues are too sweet, but with moderation and combined with something fruity and fresh, they taste great. My last ones were chocolate meringues, and they were fantastic, too. Thank you for stopping by! You have a lovely site here, am glad to follow you right back! Those meringues are so pretty, Lynn.